NoobDev.exe wrote: As this is not a mainline passenger depot, this won't be entirely possible either, however, I will be making a class 230 that goes one step further, and is available to drive, seeing as TFW is going to be replacing the pacers with the 230. This will happen, provided I can have access to a decent D stock model (hint, hint). They did have to change the motor, to run on diesel. We don't have any form of electrification down here. The fact that the D stock model will take a while doesn't matter. I knew it would, and I don't have the time at the moment to do it anyway. You take your time on it. Tanks for the good wishes for the team. Do you live near an area with 230s? I live in an area that will be operated by 230s, along with the new class 755 tri-mode trains. I live one stop down the line from Barry, so they will be operated through there, hence why I hope to have one of these. I've already tried conversions. The issue is that textures aren't currently readily available. They won't be able to be readily available for at least another few months. You could try, at least for temporary purposes, trying to recreate the textures using assets that are currently available. I believe SP1900 tried this while textures for the D Stock were unavailable, when he tried his first attempt at building the train around July 2017. NoobDev.exe wrote: I've already tried conversions. The issue is that textures aren't currently readily available. They won't be able to be readily available for at least another few months. I will mention though, that we are not due the class 230s until March or May 2019, so there is still a long time to wait before I can do it, but I could still try it. I do think we need a D stock anyway, because the one that we have now is pretty bad, for today's standards. I can't wait for your D stock model, it should be good. The first and second attempts at that model were pretty good; here is a dev photo from the time. Early days, when I first met SP1900 a year and a half ago! Life has slowed development down a bit at the moment, so I haven't had much time. So what I have done is added some hedges for some of the route. This shot shows a class 101 (May change) at Gladstone Bridge Halt. The hedges can be seen to the right and to the left in the distance. The bridge has been built since the last update, along with Morrison's on the left. Since the last update, I have now put some larger bushes lining the track between the bridge and the yard. The yard has been detailed with a class 37 BR Blue, a class 66 EWS and a class 47 BR Blue. This part of the route is nearing a completed state. 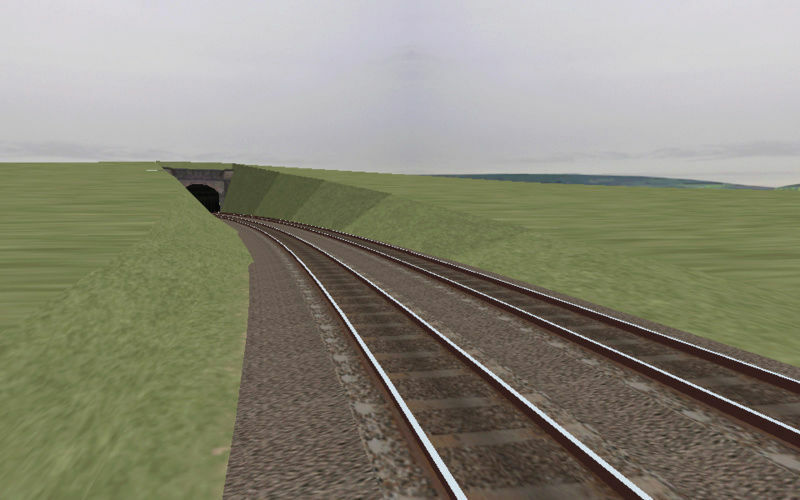 Been working on the section between Cadoxton and Barry Docks today. This section of the line passes by the famous docks that made Barry a renowned port. The docks office has been completed, along with the road that goes alongside the railway. The docks entrance has been built as well. 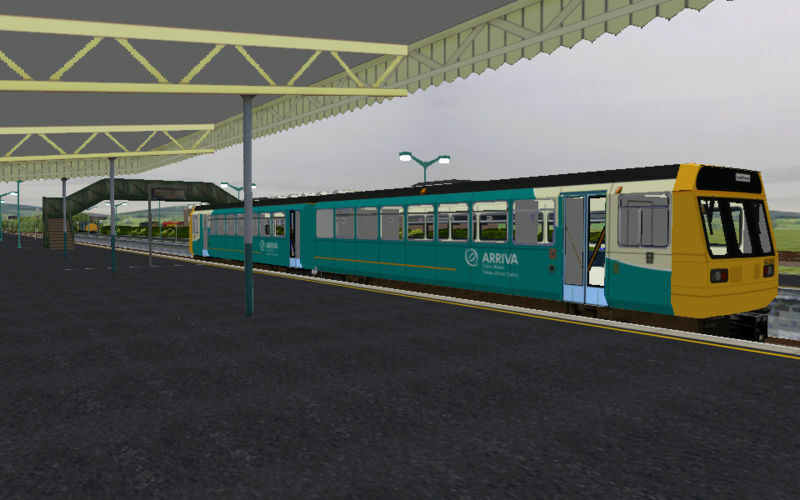 Next on the to-do list is some work on the bushes and some vehicles, alongside signage and a car park for Barry Docks station. 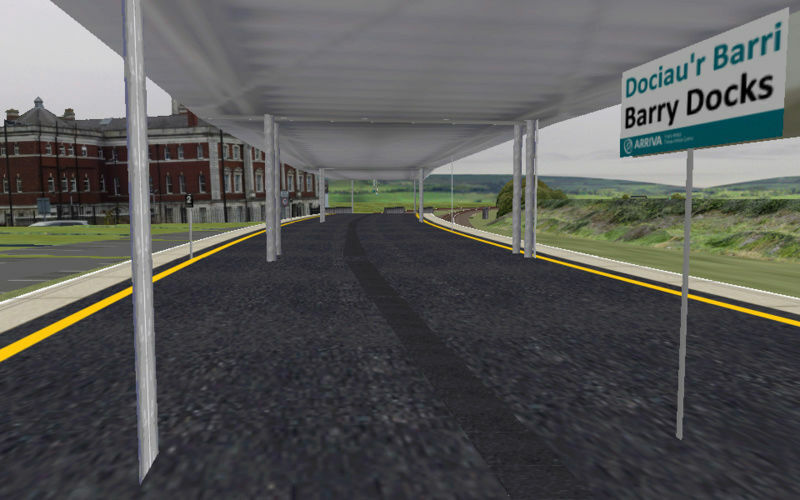 This shows the docks entrance, along with the approach to Barry Docks station. In the distance, the docks office (the big red building) can be seen. This picture is taken in the opposite direction, towards Cadoxton. Cadoxton is the entrance to the dock siding (the rusty track in the middle). Jeepers the models on the tracks are looking crisp. Simple things like that make it a very good job done. Yep, and still running at 60fps (In that section). Even through Barry Town, I am getting 31 fps! 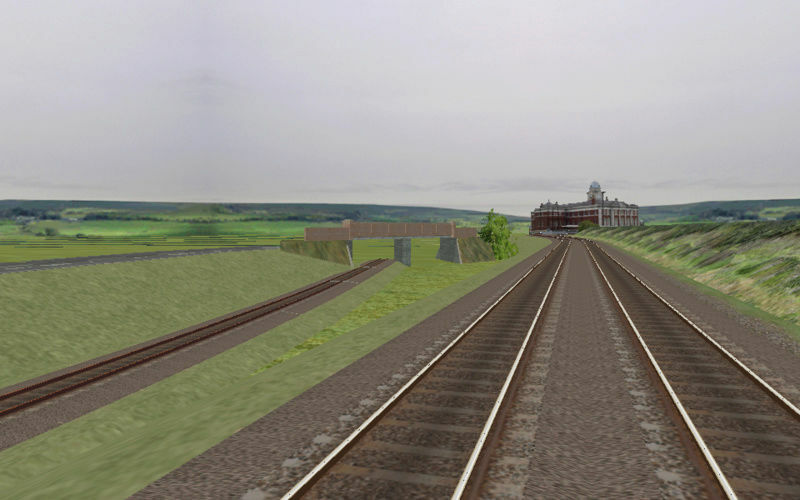 Here's a picture of Barry station, including the yard and shed. Been working on some curved platforms (TrackGen). Barry Docks, with new curved platforms. The only tunnel on the route, just outside Cogan station. It is coming along nicely now! This is looking very promising! The platforms are looking quite frankly exceptional; the sign tips it off with the buildings in the background! Been working on the area around Eastbrook station. It is the only station on the line that was built from scratch in the 80s, and not a relocation. It also has very basic platform facilities, with a simple footbridge and no constant fill for the platform. The only major thing missing here, is the houses. Most of these are 60s style semi-detached houses, but I don't have any models for them. If anybody could point out some models, or textures that I could use, that would be amazing! Eastbrook's very basic platform structure. It is not far off a wooden platform style, with a cobbled surface, instead of a wood one. The footbridge here is scratch built. Needed here is some houses, more trees and a fence between the road and railway. Here is the barrow crossing, which is the only way, by foot, that disabled people can use to cross the railway line, bar the brick arch bridge about 500m away. 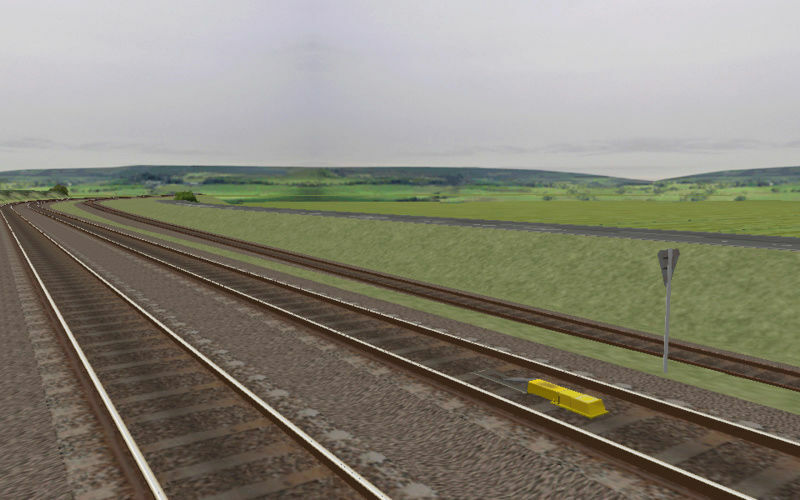 This is one of 4 barrow crossings on the lne, the only one of whcih is going to be modelled in this version (The other three are in Rhoose and between Llantwit and Bridgend, not modelled as of yet). Hope you enjoy the screenshots! Most of these are 60s style semi-detached houses, but I don't have any models for them. If anybody could point out some models, or textures that I could use, that would be amazing! How d'you think I made my Welsh route while sat on me arse across the Irish Sea?? Use Google street view to grab some base house textures which you can easily fix up. In fact, the terrace houses in the "Ballyfeckin" route as the train leaves Waterville are, in reality, from Cardiff!! I would go out and take pictures myself, seeing as I live a couple of miles away. However, I can't at the moment. Google street view and Google Earth is a good way to do it, as I did it for the Docks Office, it didn't cross my mind for the houses. The texture of the cobbled part of the platform makes me wonder. Are the cobblestones actually at an angle to the platform edge? Usually they're aligned, cause cutting them down is much work. Also I think it should be displayed at a smaller scale, at least they look like those used around here, and those are maybe 10*20cm in size. These are not the correct cobbles for the job, however. The cobbles on the platform are actually frilly and are smaller. The texture is actually taken from a road, hence why it is too big and slightly wrong. I am probably going to take a visit to the area soon to get some more textures. The cobbles are indeed at a right angle, after some research. I was doing that bit from memory, because I remember it being angled. This picture shows what I mean. It is someone else's picture.